"The higher he rose, the simpler and purer Ho seemed." 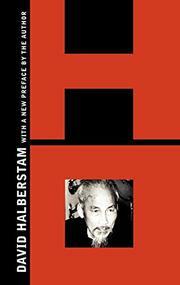 Halberstam's little book is likewise simple and pure, more of a commemorative ode than a biography. He emphasizes Ho's personal qualities, his gentleness, his asceticism, his tranquil abiding faith in Vietnamese independence. Ho's thirty years as a revolutionary exile -- he was a pastry cook in London, a contributer to L'Humanite in Paris, a student of international communism in Moscow, and a political fugitive all over Southeast Asia -- remain as shadowy as ever. Halberstam stresses Ho's desire to arrive at a political accommodation with the French in '46 and again in '54 ("France and Vietnam were married a long time. The marriage has not always been a happy one but we have nothing to gain from breaking it up"); his aversion to China and his continuous strategic though sincere subordination of Communist doctrine to broadly-based Vietnamese nationalism. The French and American involvements are treated as delusion, folly and racial arrogance. The Western predicament was ironically summed up in Graham Greene's The Quiet American and any further sifting of political and military strategies is superfluous. Dien Bien Phu was the retribution for French hubris, and the Americans should have learned a lesson but didn't. Halberstam, author of the Pulitzer Prize winning Making of a Quagmire, has obviously renounced his earlier, more equivocal view that South Vietnam "may be worth a larger commitment on our part." Those interested in a more intensive look at Ho's career must go back to Jean Lacouture's Ho Chi Minh (1968).